Grafted Yes, on Native American Persimmon 'Diospyros virginiana"
One of the first crunchy persimmons to ripen of the season. Mid size flatten tomato-shaped fruit have a spicy sweet flavor. One of our favorites mixed in fruit salads. 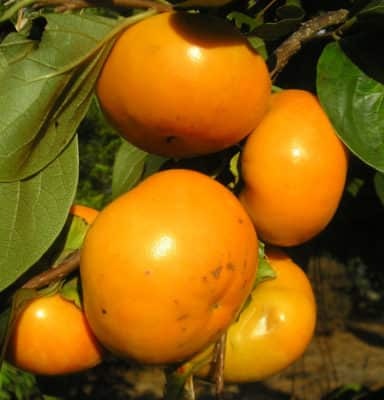 The Izu persimmon tree is also a dwarf tree and typically only grows to 8-10 feet tall. Great choice for small yards. Fruit ripens late September through mid October. 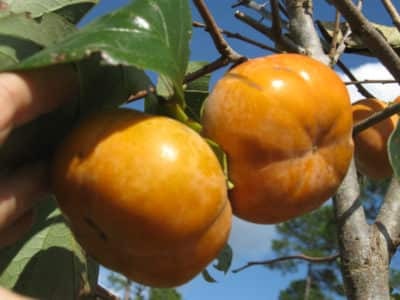 Yes, on Native American Persimmon 'Diospyros virginiana"
Persimmons are one of the loveliest trees to be found. They have smooth, gray to tan bark, and broad, leathery, jade-green leaves (2-3 inches wide and 4-6 inches long). The large varieties average 25 to 30 feet at maturity, a good size for lining driveways and paths, or as a specimen or accent tree. The small ones are usually very heavy bearers, and are great in small groups in the shrubbery border, with low annuals or ground-cover beneath them. All persimmons have spectacular fall colors — bright yellows to clear oranges, light pinks to fire-engine reds — and the whole show happens just as the fruit colors up! Persimmon fruits look like translucent orange orbs, hanging amongst leathery green foliage. They are still something of a rarity in this country, but those in the know agree there is no more beautiful sight than a group of golden persimmons ripening to a sweet perfection on a sunny windowsill. The smooth, custard-textured flesh closely resembles sweet bananas and mangos. Enjoy persimmons fresh in fruit salads or sliced and served with cheese and wine, They are wonderful for cooking used as a sweetener in sauces and marinades. Think of them like bananas when you bake them in breads, pies and puddings. We have found the astringents to be the best for drying, Dried, they taste like maple syrup. 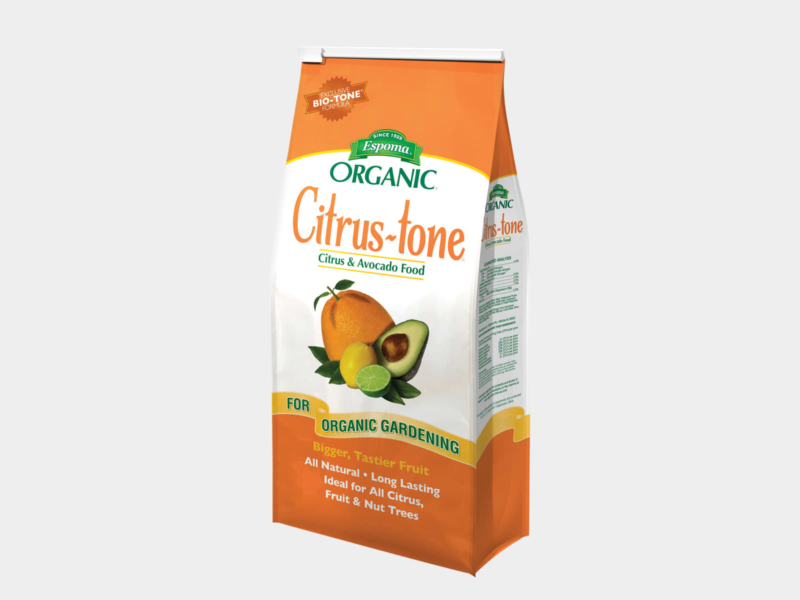 Fertilizer to Maintain: Our varieties of Persimmon Trees work great with Espoma Organic Citrus-tone Fertilizer. The trees, very hardy and well adapted to our area, are known to live upwards of 75 years. 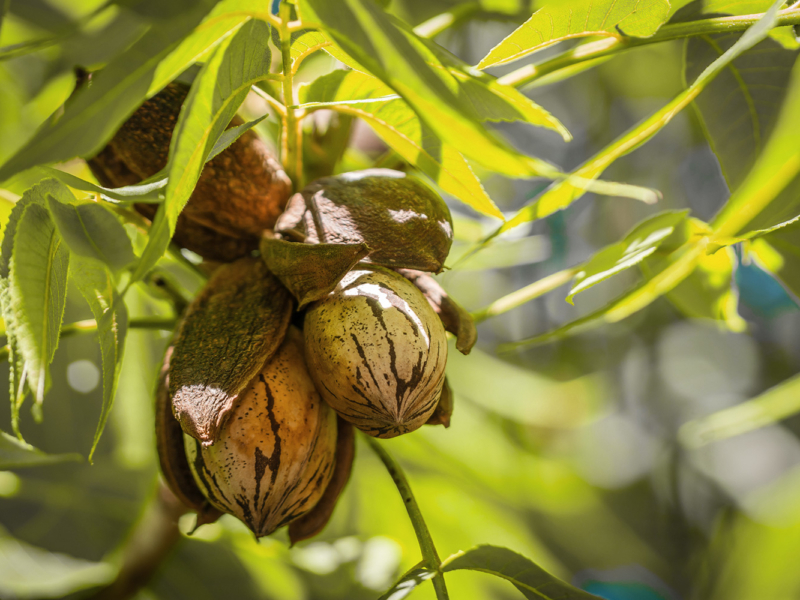 They require little attention once established and often reward high nitrogen feeding by dropping their fruit. Over 500 varieties have been developed throughout the Orient, with fruit ranging from small plum-sized to football-sized, with just as many flavors and textures. We’ve narrowed it down to what we feel are the very best varieties. 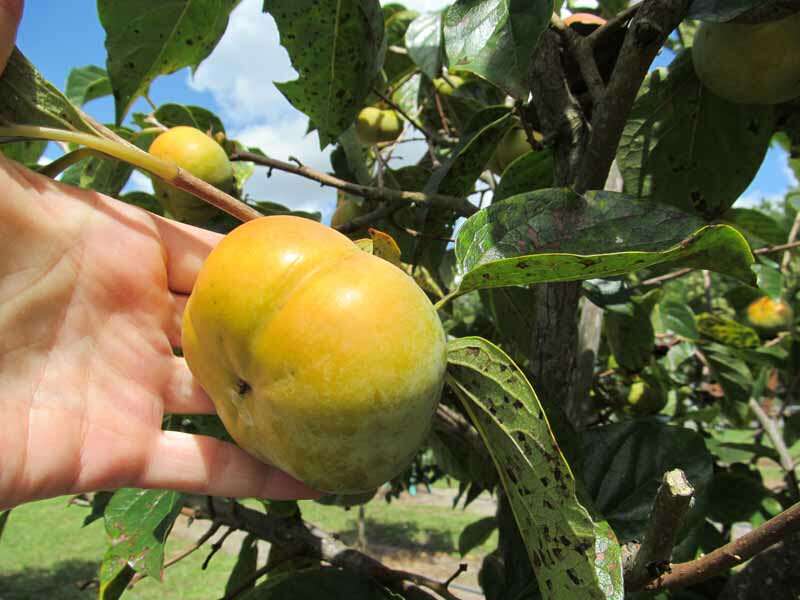 All the persimmons we offer have been grown in university test orchards in Northern and Central Florida, and have proven to be solid, consistent bearers. There are two basic types of persimmon fruit — astringent and non-astringent, or puckered versus non-puckered. You can be easily fooled into eating an astringent persimmon, because the astringent varieties turn orange and look ripe long before they really are. They should be eaten only when completely jelly soft to the touch. Non-astringent persimmons may be eaten while still firm and crisp. As a group, the astringent varieties are sweeter, richer, and juicier, while the non-astringent types are crispy, mellower and more sugarcane or cantaloupe-flavored. 1. Don’t wait until your Astringent persimmons are ripe (mushy). For less mess in the dehydrator, choose persimmons that are slightly soft. You can also dehydrate Non-astringent persimmons with these same instructions. 2. Wash the persimmons and cut the “cap” off the top. Slice the persimmons 1/4″ – 3/8″ thick. You don’t have to peel them – the peel is yummy too! 3. Place your persimmon slices on your dehydrator trays. Fill the trays but don’t overlap the persimmon slices. 4. Stack the trays in the dehydrator. Turn it on and set the dehydrator to 155 F.
5. Check every 8-12 hours and turn the persimmons (flip them over) when you do. It should take 24 hours to dehydrate a full batch of persimmons (5 trays full). Once completely cooled, place dried persimmons in a zipped freezer bag and put in the refrigerator or freezer for long term storage. Dried persimmons are best when eaten at room temperature.